Spongease Perfect Potting Soil is convenient, economical and works fantastic! Plant roots absorb the ideal balence of water, air and nutrients. Spongease Perfect Potting Soil resists over and under watering. Just add water! Each Spongease will fill 1 cup. 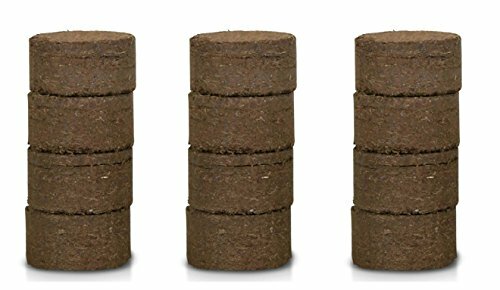 Spongease is compressed coconut coir that expands with water making the perfect potting soil for seedings, rooting, vegetables, berries, roses, orchids, house plants and more. Soak one Spongease disc in a dish with 1/2 cup warm water, fluff up and add to planter with plant. Spongease contains no fertilizer it is recommended to add plant food for optimum growth. The fibrous nature of Spongease makes it the perfect potting soil because of its ability to supply oxygen, water and fertilizer to plants roots without over and under water. Used widely by professional growers, now homeowners can get the same results, remember just add a slow release fertilizer to the pot or feed with a liquid fertilizer, and its 100% organic and eco friendly. Combine Spongease with an Aquaphoric complete self watering planter for a passive hydroponic system your plants will love! Happy Growing! !